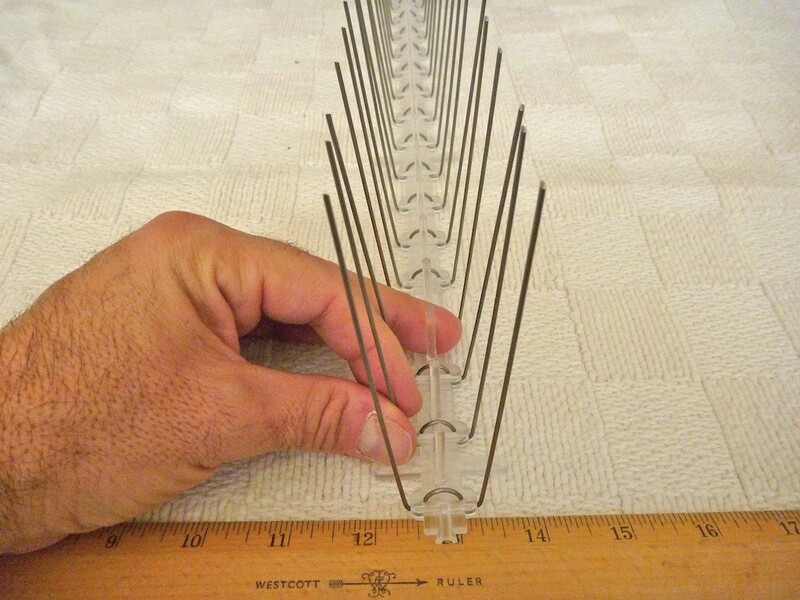 PRODUCT DESCRIPTION: Standing about 4" tall, this model has two rows of spikes with about a 2" spread. Ideal for both commercial and household use, they can be mounted to window ledges, roof lines, statues, and just about anywhere you need to repel birds and other small animals. The base has small holes which can be used to mount sections with a nail or screw. They can also be adhered using liquid nails or some other common glue. Each strip is about 2 feet long and is sold per section with bulk pricing available. WHERE TO USE IT: This model is for true commercial applications where cosmetics are not a concern. Ornamental statues, ledges, terraces, roof tops, chimneys, air conditioning units, antennas, window ledges, gable vents, rain gutters, etc. Mount them with screws, nails or adhesive silicon (Liquid Nails works great). RATE OF APPLICATION: Based on linear feet and the width of area you want to protect. This model comes in 2 ft strips.